First posted March 6, 2012. Private-label branding is a huge topic, and a very interesting one. I wrote a huge post about it here, focusing on Hellman’s (or, for you westerners, Best Foods) mayonnaise lookalikes. The question is: How close to a famous brand’s trade dress (which may in and of itself be protected by trademark) can a “store brand” or private label package get before there’s a plausible argument for unfair competition base on consumer confusion? Here (above) is a cute video I even found on this topic, via this Australian website. It’s a hot issue, and Rebecca Tushnet probably wrote up the best blog treatment of it. The [McNeil Nutritionals, LLC v. Heartland Sweeteners, LLC] opinion began by noting that, in 2005, private label products accounted for 20% of all US supermarket, drugstore, and mass merchandiser sales, or $50 billion. At that time, more than 90% of consumers were familiar with store brands, and almost as many bought them regularly. Such brands are typically found next to the coordinate national brands, and their packaging often invites comparison with a national brand, whether by similarity in dress or by “compare to” statements. Shelf tags also explicitly invite comparisons. 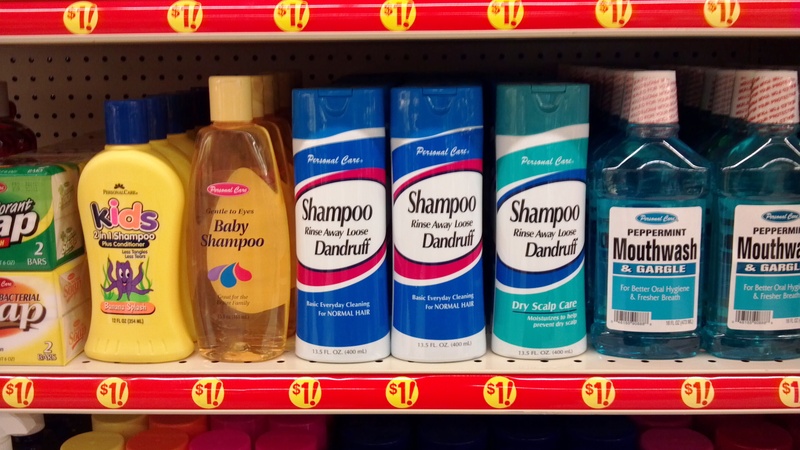 The court accepted as fact that consumers are generally aware that private label products are sold next to national brands, and that prominent price displays allow consumers to see the cost differences between them. So the consumer “gets” the concept of the private label, expects the private label product to be compared to the famous brand, and makes a choice. As it turns out, the illustration above is one Rebecca used to illustrate her blog post: a collage of Head & Shoulders shampoo bottles and various private label products that look more or less alike the real thing. Some more, some less. Yep: It looks like Head & Shoulders – the famous dandruff shampoo. It has the word DANDRUFF prominently displayed on it. 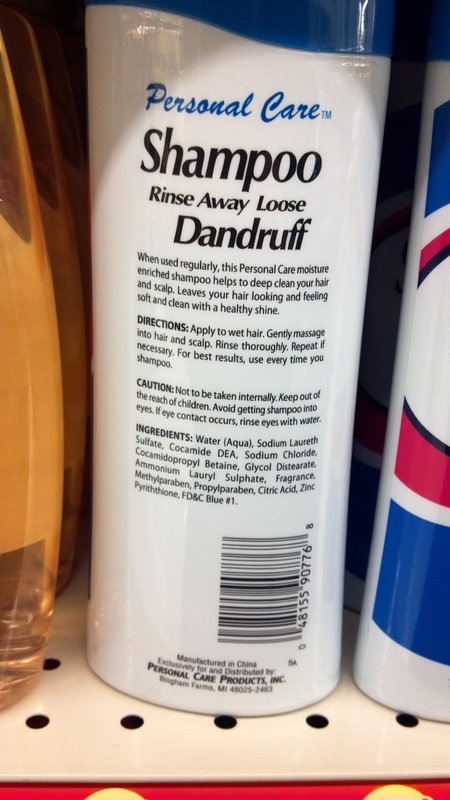 But what does it say in relatively small print between “SHAMPOO” and “DANDRUFF”? Yeah – “basic” as in “not a dandruff shampoo” at all. It will “rinse away loose dandruff” – just like a mop-full of soap out of a public-restroom dispenser would. 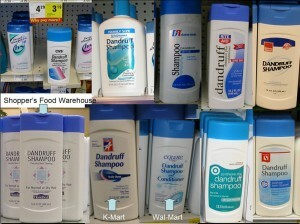 Not like Head and Shoulders, or even a respectable private-label “knockoff” will claim to do, or at least to try to do. You’re not choosing between good, better and best here. You’re choosing between good and banana. Now: If you accept the premise, which perhaps is debatable, that this is lookalike packaging that is a trademark infringement, I’d have to say that this practice is deceptive. I have to think that it is aimed at the non-English-speaking, very-little-English-speaking or perhaps shampoo-drinking buyer. 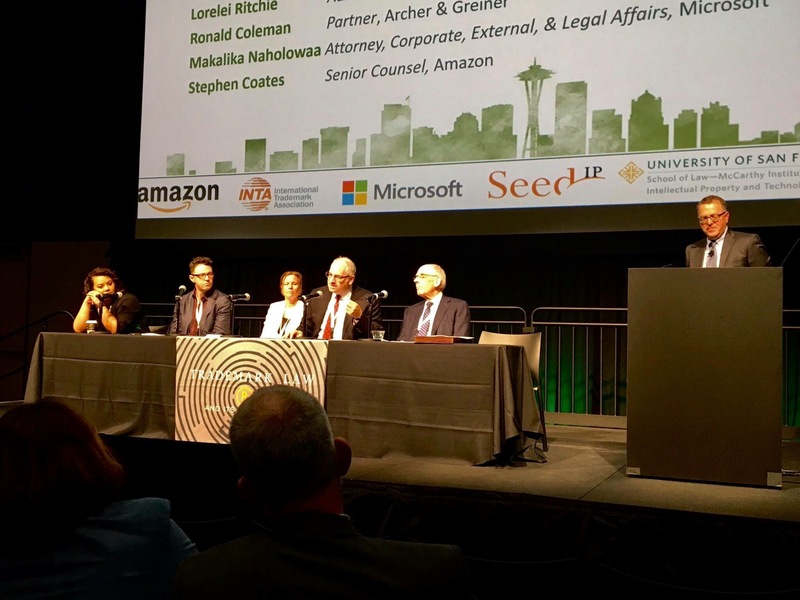 Yes, it is heavy-handed, down-the-middle, let-the-buyer-beware deception. It is clearly meant to be. The bottles are meant to kind of look like the ones at like left. The theme is on blue tones offset with pink-reds and a swirling graphic. The shape is very similar. The allusion by the Personal Care bottle is even stronger with respect to the color combination and arrangement on an older bottle, which itself echoes decades of Head & Shoulders bottles, still seen in the squarish example shown on the right. But mushing these together, in an of itself, probably doesn’t make a trademark infringement. You can’t stitch together different packaging used at different times to create a “dynamic” or pastiche trade dress protectible under the Lanham Act. So this is a clever bit of manipulation by the Personal Care folks, I think. On the other hand, didn’t we say that consumers have been trained to distinguish between private labels and the famous products they are mimicking? 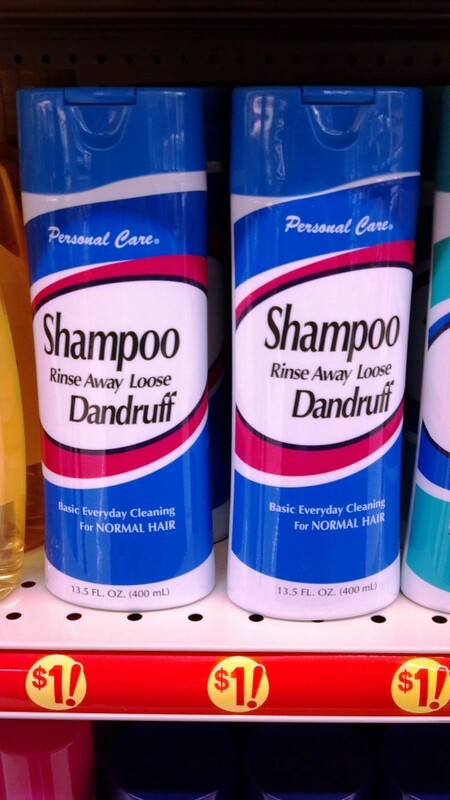 This package screams out, “Respectable Head & Shoulders knockoff! !” But it’s not a dandruff shampoo at all! And that is deceptive. Such brands are typically found next to the coordinate national brands, and their packaging often invites comparison with a national brand, whether by similarity in dress or by “compare to” statements. Shelf tags also explicitly invite comparisons. 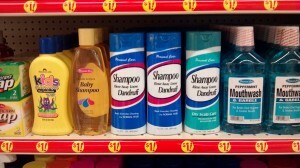 The court accepted as fact that consumers are generally aware that private label products are sold next to national brands, and that prominent price displays allow consumers to see the cost differences between them. This shot is actually from the end cap of the shampoo aisle, facing the back of the store. 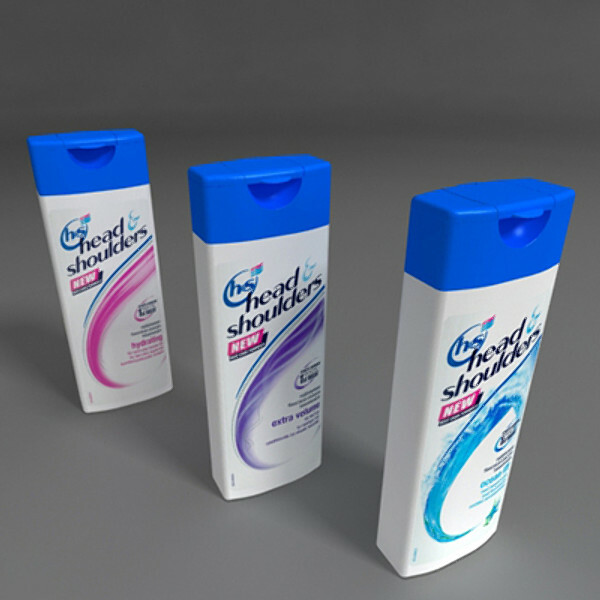 The fake Head & Shoulders is placed, not next to real Head and Shoulders, but between fake No More Tears shampoo and fake Listerine. That solves the problem then, right? No… I think it might make it worse! The consumer (again, not the sharpest consumer, but “the consumer”) is now being deprived even of the ready comparison that might perhaps tip off the deceptive description of the product. Maybe he thinks he has been transported into a generic world, or perhaps a store for tourists enjoying the charms of the Eastern Bloc? Deprived of the context and the ready comparison, and beckoned by the $1 price tag… well, what do you think? That’s meant to shout out “Dandruff Shampoo! Like Head & Shoulders!” That’s what’s deceptive. And I think it’s not a matter for a Lanham Act claim, but for the Federal Trade Commission. Or the good people at Acme Markets, owned by an outfit with the brand-ugly name “Supervalu,” who should be ashamed of themselves for putting this stuff on the shelves.